What, no butter? 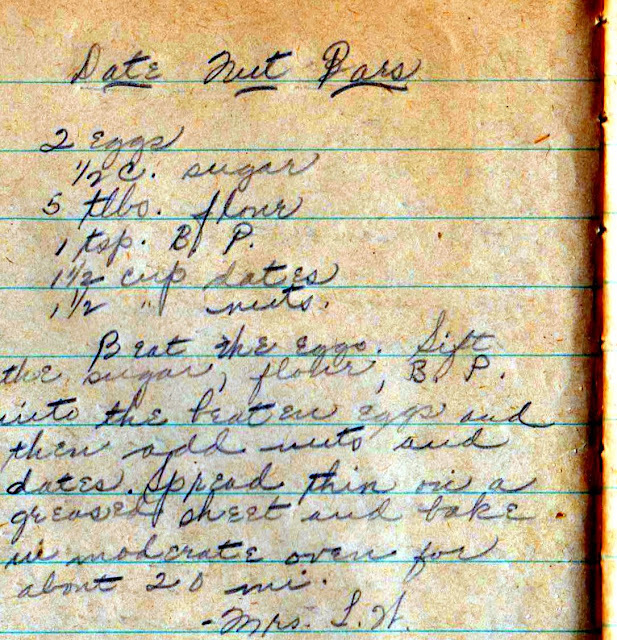 I couldn't imagine what this date nut bar recipe would produce: it has no butter and only five tablespoons of flour. 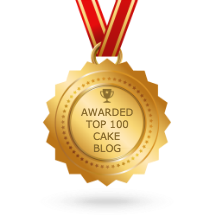 I began with more than a bit of trepidation and ended as a very happy baker. These are delicious -- a 1940s version of a granola bar, albeit without the granola -- and easy-ish on the waistline. The recipe, written in a composition book, is from a large collection of Amish recipes I purchased last week on eBay in an rather intense bidding war. Like many recipes of its time -- perhaps the lack of butter was a result of food wartime food rationing? -- this recipe features dates and nuts quite prominently, not that there's anything wrong with that! The batter is quite sticky, but I used an offset spatula and my latex-gloved hands to spread it in the cookie sheet. After about 20 minutes in a 350 degree oven, it transformed into the cake below. These were wildly popular at work. Guess it was a slow sugar week. Oh! Excited to try this! Do let me know if you do! And I love your blog! I made these over the weekend. They were quite good. The only problem was that they were hard to get off the cookie sheet even though I'd greased the pan. It looks like you used parchment paper. That might be the way to go. Overall, they were very good and I'll be making these again. Marsha - Sorry about the sticking problem but glad you liked the end result. I always use parchment out of laziness (and also I bought a huge amount online by accident). Not understanding the amount of flour in this recipe - want to try it but looks like 5 tablespoons? That can't be right! Yes, just 5 tablespoons of flour! An unusual amount I know, but it works. I am anxious to try these. What size pan do you use...11x7/13x9/10x15? Thank you for your post. I just found this very similar Date Nut Bar recipe among my Grandmothers things. I was JUST going to put them in the oven when I realized there was no oil or butter. She grew up in PA so this Amish recipe makes perfect sense. YAY! My mom did something with Bisquick but I was wanting to try this one. THANKS! Merry Christmas! I, too, am extra excited to bake these lovely treats today. Grew up in PA and mother always made these at Christmas which everyone loved. Unfortunately, most of her recipes were in her head and not written down. In the years since her passing I've tried several different recipes, and while good, did not quite hit the mark for me. The only ingredients I do remember were an addition of orange juice, but how much I have no idea, plus when cooled the bars were rolled in powdered sugar. Just sweet enough but not too sweet and everyone always loved them. So thank you for this recipe which hopefully will be just like my dear mother's. Will let you know soon. 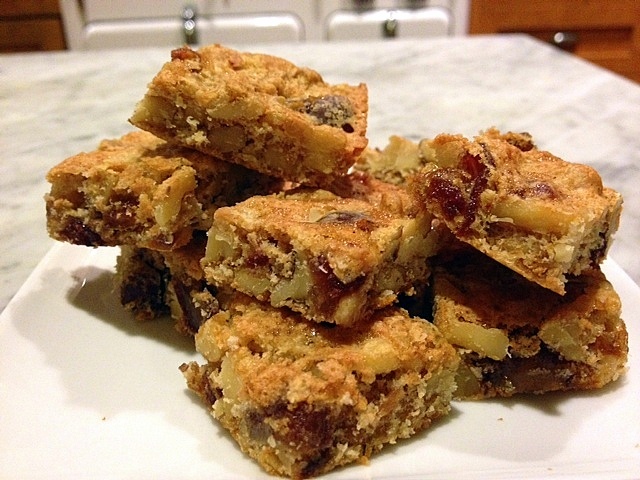 MORE.........This was the easiest of all date/nut bars tried in the past, and delicious too! Used a greased 10" cast iron skillet, because it was the handiest pan, and it's been used before for chocolate chip cookies, so figured it would work out. So easy, so tasty and easy clean up too! Not too hard to spread the dough with a rubber spatula and removal was pretty easy as well. When cooled sprinkled powdered sugar over the tops just like my mother did. Next time may just add a bit of oj, as she did, to see what difference it might make. Thanks so very much for finding and sharing this wonderful Amish recipe! MORE.......baked this morning in a greased 10" cast iron skillet, following all directions. Simple, easy, quick and tasty! Used the skillet because it was the handiest of any pan, and previously had baked chocolate chip cookies in it a la Martha and Pioneer Woman, so figured it would work. One bowl, one pan, one spatula, delicious! Next time may add a smidge of oj, just as my mother did, although not sure what difference, if any, that will make. 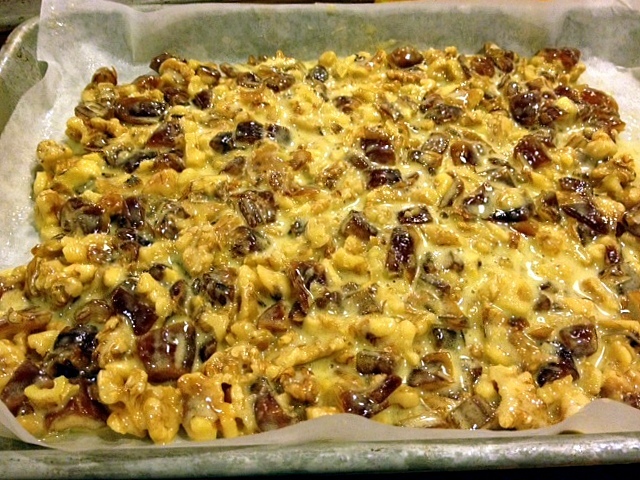 So thanks so very, very much for finding and sharing this terrific Amish recipe! Have made this a few more times and added 1 tsp. oj, which was just perfect! More could probably be used, but was timid with it, unsure of how it would work. Brother tasted it and said the same thing: this is just like Mother's recipe! We are all thrilled with it so thanks again.